The struggle is real. The tears, the fights, the neverending stress. It’s all just part of your daily after-school homework ritual. You’ve tried everything: tutors, breaks, changing locations, even bribes. Nothing has worked. You’re exhausted and at the end of your rope. With a new year, you are ready for a big change. Something daring, something bold. It’s time to stop the homework overwhelm with smart limits that work. It’s actually pretty simple. Just stop. No, not stop as is don’t do, never do. Stop as in pick a reasonable stopping point for the day. Have a great school year from Day 1 with the Ultimate School Success Kit! According to recent research studies, homework does help boost academic performance generally. The most benefit was found to be for students in grades 7-12. Additionally, the National Education Association recommends just 10 minutes per grade level. For example, a student in second grade should be doing about 20 minutes of homework every night. If your child is spending hours on homework, call it quits. Especially in elementary school, there is no reason for a child to be spending hours and hours on homework every night. The every-once-in-a-while long haul night, sure. For projects or after a long absence or to study for a major test. But every single night? Nope. If you find that this is the case in your home, email the teacher to let her know. She might not even realize how long homework is taking your child! I wanted to let you know that (Child) is taking about (rough estimate of average nightly homework time) to complete homework every day. I feel like this might be too much homework for him/her. I’d love to find a happy medium that works for everyone. Can we talk about easy accommodations to reduce the homework load? Then suggest that your child pick any 5-10 math problems, just do the evens or odds, pick any 2-3 reading response questions, or that he’s able to answer written work by voice and video recording. You can tweak these for your child’s normal homework assignments. I’ve noticed that my child is doing (average minutes) of homework nightly. This is more than the NEA recommended time of (grade level x 10 minutes = total homework time). I will work with (Child) to complete the nightly homework assignments in that amount of time. After we reach (NEA recommended homework time), I’ll mark the page and leave a note in his agenda book. Please let me know if we can work together on this. 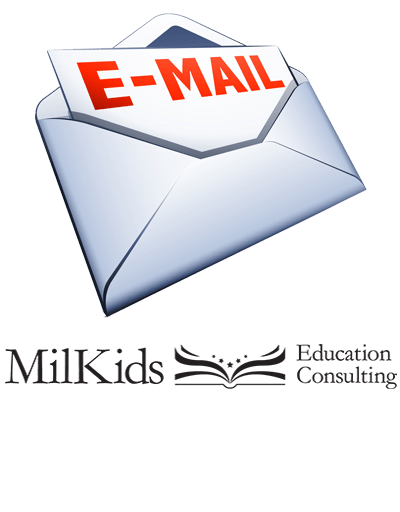 These emails are better for students in elementary and early middle school. In high school, help your child advocate for themselves using similar emails. Use the ultimate school communication guide, Talk to the Teacher, to make school easy! If your child is frustrated, just stop. Every person has a breaking point. Children can get easily frustrated by hard homework or long assignments. If your child is upset, crying, or angry about the homework, taking a break or calling it quits can help. Use your best judgement to make sure they are using the get-out-of-jail-free card appropriately! I wanted to touch base about tonight’s assignment in (subjects). (Child) worked on the homework for (length of time). S/he was getting very frustrated and becoming upset. Rather than create more stress, we decided to pause the assignment for the night. Would you take a peek tomorrow to see where the trouble might be? (Child) might not feel 100% confident yet and I don’t want to contradict your teaching. If there are at-home resources we could turn to, that would be amazing! I look forward to trying again tomorrow. You’ll get email templates just like these, plus many more, when you buy your copy of Talk to the Teacher. Your e-book or paperback is filled with done-for-you meeting scripts, email templates, and talking points to make sure that you are getting your point across. You’ll feel confident and empowered whenever you need to send an email or talk to the teacher! It’s ok to stop the homework. Learning how to step away from a frustrating situation is a life skill. By supporting your child and showing him how to work to frustration, you will be teaching perseverance. Then, showing how to step away to regroup or even just walk away helps your child to know personal limits and coping skills. It’s still learning, just not the assignment! How do you handle tough homework nights? Share your best tips in the comments!